Here is an all-night glowing rock which when hit with a blacklight strobe, will have an interesting animation effect.It never ceases to amaze how a simple object can take on so many different views, just through innate or natural lighting effects. The rock is rather large, uses a lot of paint, both reactive and non-reactive and keeps me company along side my bed at night. 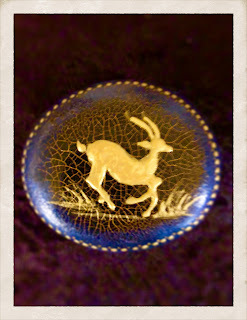 This week's rock features an antelope in motion. The figure itself was drawn on the rock first, then filled in with gold paint.The rock itself was painted black and coated with a crackle finish. The crackle was filled and buffed with gold paint to fill in the cracks to give it an antique look.Lastly, the edges were finished with an indigo blue. The rock type is Mexican Pebble, which is a very smooth stone.It sometimes will take two coats of paint to cover the brush strokes and exposed sides. 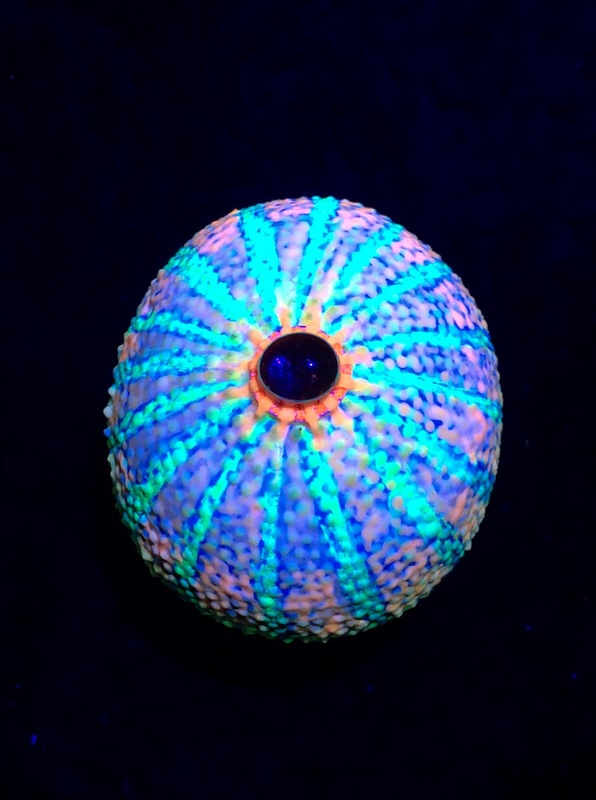 When dry, the rock is again clear coated with spray Krylon.Although this is not a glow in the dark rock, it still showcases my own ability to do detail.